The brain is constantly bombarded with diverse sensory cues and internally generated signals. Within a brief timespan sensory signals can include a visual scene; the flow of visual information during movement; an odor cue; a sound coming from a particular direction, the body’s feedback from walking, the sensory feedback from turning the head. Deep in the temporal lobe, in and around the hippocampus, many of these signals are fused into a unified brain signal from small group of neurons that signals the subject’s location. Each of these cells fires whenever the subject is in a particular location in its environment, largely independent of behavior in the location. These are place cells. The aggregate of place cells, each with its own firing field, depict a map-like representation of space, indicating specific locations and routes spreading across a two-dimensional terrain. When a place cell fires it appears to be signaling the animal’s current location with respect to the entire map. One can imagine how information from this map in the brain is useful not only for complex navigation, but also for selecting appropriate environment-specific behavior, and for recalling previous events that occurred specific locations. In all likelihood, the unified output of place cells is responsible for the unified conscious perception of being in a place in an environment. 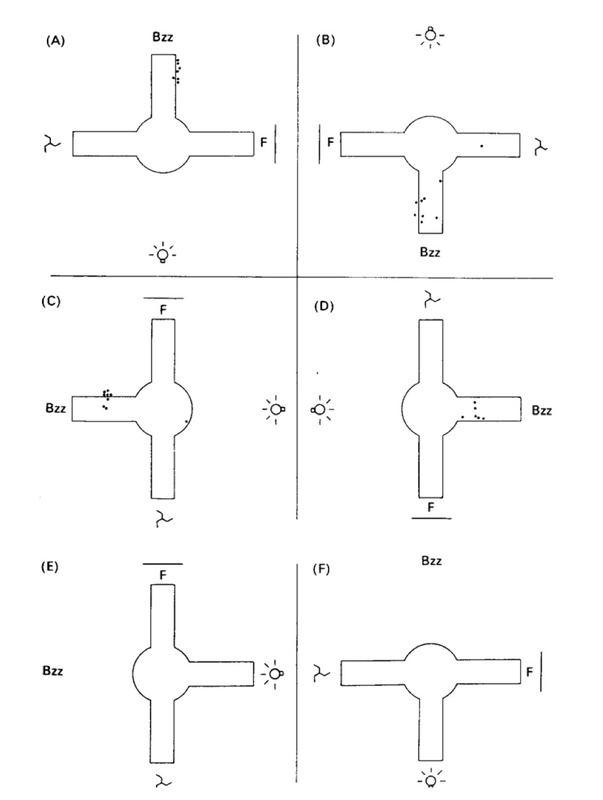 Figure 26a from The Book. Overhead view of T-maze, dots are place cell spikes. Illustrates the firing rotates with subsets of distal cues: fan, buzzer, light. the maze, another cell in a second location, and so on. Although they referred to these cells as “place cells”, the broad significance was not apparent. Discovering “place cells” while recording deep in the brain, far from sensory inputs or motor outputs, was a bit like realizing that the answer to the “ultimate question” without knowing the question2. Place cells appeared to signal something about “place”, but what? How did the information get there? How was it used? The discovery opened a Pandora’s box of questions. The nature of place cells suggested that the answers to these questions would yield insights into mechanisms of neuronal processing, cognition and psychology. The discovery itself opened a set of questions, but did not provide immediate answers. Following the place cell discovery, O’Keefe’s work followed two paths. The first path was to continue experimental investigation. For 40 plus years O’Keefe and numerous others have followed this path, which eventually led to this year’s Nobel Prize in physiology and Medicine awarded to O’Keefe, Edvard Moser and May-Britt Moser. 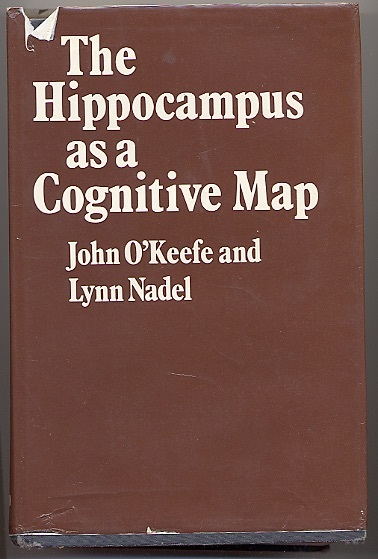 The second path was to collaborate with Lynn Nadel to write “The Hippocampus as a Cognitive Map” henceforth, “The Book” (1978). 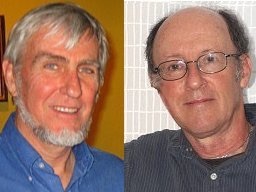 Shortly after graduate school (McGill) and post-doctoral work, O’Keefe and Nadel were young faculty with separate labs at University College, London. In parallel with O’Keefe’s discovery of place cells the two collaborated on explorations of the intellectual foundations of the place cell discovery. Along with the discovery of place cells, The Book is the theoretical foundation of hippocampal function. “The Book” was a bold proclamation, setting an initial theory of what place cells were about. The layout was much like the hippocampus. From a particular location the book surveys the past, the present and the future. The past is represented in a broad survey of philosophy, studies in animal behavior, and lesion studies of the hippocampus the authors feel are the foundations of the “cognitive mapping theory”. The present is a survey of hippocampal anatomy and physiology, focusing on an early (1978) description of place cells. The future is the presentation of the first neuronal and network “model” of how hippocampal place cells are formed and their contribution to behavior. This is the “cognitive mapping” theory. The theory includes speculations of the hippocampal role in memory and language. Let’s survey the book, chapter by chapter. Chapter 1. The startling introductory chapter is a 60-page survey of the philosophical roots of space and spatial perception, covering Kant, Liebnitz, Newton, Poincare, James, Piaget, Gibson and others. Decades ago, on first reading, I got lost about 10 pages in. This past weekend I got a little further — it’s a tough read. It is a brave and scholarly achievement for two non-philosophers. O’Keefe and Nadel identify two spatial conceptions: relative space and absolute space. Relative space covers a lot of territory. In human terms it coincides with “personal space”, the space whose coordinate center is somewhere on the self; also called ‘egocentric’ space. “Relative Space” also includes space as conceived by Einstein. “Absolute space” is Newtonian. It is singular and not viewer dependent; there is a single absolute space in the universe. O’Keefe and Nadel feel that Kant had it right: humans have an inborn sense of absolute, Newtonian space. O’Keefe and Nadel feel that humans and animals use absolute space and that it is generated in the hippocampus. Chapter 2, Spatial Behavior, reviews human and animal literature on spatial problem solving. Starting in the 1940s the psychologist Edward Tolman interpreted rat behavioral data by suggesting that rats created map-like representations of the problem space. This is the origin of O’Keefe and Nadel’s use of the term “cognitive map”. Clark Hull disagreed with Tolman, and argued that the behavioral data could be explained by stimulus-response chains. This dispute continued for decades. During the 1950s and 60s, Hull’s behaviorist interpretation was dominant. The advent of “cognitive psychology” in the late 1960s championed Tolman and his maps. O’Keefe and Nadel brought the brain into the picture. Chapter 2 introduces the terms “locale” navigation and “taxon” navigation. These are roughly synonymous with map-based navigation (locale) and route-based navigation (taxon). Lynn Nadel says the term “taxon” was chosen to mean, roughly separating into discrete categories, as in biological taxonomy. * This is confusing, but permits generalization to different brain processing systems, with the map-processing system limited to two or three map-like dimensions, while taxonomic processing has no obvious dimensional limit and no metric. Chapter 3, Anatomy, is a solid summary of hippocampal anatomy. Largely up to date. Chapter 4, Physiology, is the key chapter, summarizing experimental data. The first half of this chapter summarizes the then-current knowledge of hippocampal EEG studies in rats. EEG is relatively easy to record; put a large electrode into a brain region, amplify the signal, and record the sum of electric currents produced by large numbers of neighboring neurons. If the neurons are synchronized, slow, synchronous extra-cellular currents should be observed. When EEG recordings are made on the rat hippocampus, roughly half the time a steady 6-10 cycle-per-second wave is recorded and termed the “theta rhythm”. Theta in the rat occurs whenever the rat moves and when the animal appears to be paying attention to distant objects. By 1978, the time of book’s publication, rat theta had been carefully studied for over 20 years, both in terms of the underlying physiology and its behavioral significance. The correlation with movement suggested to O’Keefe and Nadel that theta was an essential mechanism of the cognitive map. The second part of chapter 4 summarizes single-cell recording in the rat hippocampus, focusing on John O’Keefe’s place-cell studies. At the time, single cell recording in awake, unrestrained rats was a cutting-edge technology. Tiny wire electrodes had to be fixed in a stable location near the cell under study (done blindly, with the aid of a brain atlas). The trick was not only keeping the electrode in a stable location, but amplifying the tiny signal from a single cell’s action potential so it wouldn’t be swamped by interference from a moving cable or resistance in connections between the rat’s head and the rack of recording equipment. O’Keefe and Jim Ranck were among the first to solve this problem by putting amplification on the rat’s head. Specifically, they used newly-developed field-effect transistors (FETs) that were small enough and rugged enough for the job. The book summarizes O’Keefe and Dostrovsky’s 1971 findings (above) as well as subsequent work where place cell activity was better documented. The new studies showed that when the experimenters rotated distant stimuli (fan, buzzer , lamp ) firing patterns rotated, and that spatial firing was not dependent on any single cue. The figures the Book and the early papers were marginally convincing, and there was no quantitative analysis. According to Jim Ranck, most prominent neuroscientists were initially either dismissive or annoyed. **** It wasn’t until the mid 1980s that computer data acquisition produced convincing displays that convinced a broad audience that the place-cell phenomenon was robust. The final section of chapter 4 presents a model for how sensory input is transformed into place cell firing and how place cell firing can be used by the animal to compute direct, efficient tasks to goals. The model is based on two physiological observations: place cells and hippocampal theta (EEG), with lots of speculation to fill in the gaps. O’Keefe and Nadel, sensibly, used place cells to identify familiar environmental locations; they speculated that the oscillations of theta rhythm that occurred during running could measure distance. O’Keefe and Nadel realized that if the hippocampal system were to guide navigation, it needed a sense of direction, but brain-based directional signal was obvious. Within 10 years Jim Ranck’s discovery of head-direction cells would solve that problem. Still later, the Moser lab’s discovery of grid cells would displace theta as a candidate distance metric. Nonetheless, the model was represents a starting point, replaced by more detailed models in subsequent decades.The significance of the model, in my mind, is not that it was a good or adequate model, but that it was a serious proposal of a brain-based mechanisms for navigation. More recent models that include recent discoveries are major improvements, and suggest an eventual solution. Parenthetically, on re-reading the book this past weekend I was surprised at the cursory attention to spatial learning. The model assumes that maps are learned, but there is little elaboration. As graduate students in McGill, O’Keefe and Nadel were students of Donal Hebb and deeply familiar with Hebb’s neuronal learning model. The final few sentences of the chapter suggests both Hebb’s model and long-term potentiation, but these ideas are not elaborated. Later models deal extensively with learning, focusing on descriptions of how hippocampal synaptic plasticity permits the mapping of landmarks and paths in a new environment. The final two chapters (14 and 15) extend the findings to humans, in particular, to the human amnestic syndrome. The profound Amnesia produced by hippocampal damage was first described 25 years before the book’s publication; The chapter carefully summarizes Scoville and Milner’s seminal work describing the HM’s amnesia along other studies that confirmed the hippocampal-memory relationship. O’Keefe and Nadel speculate on a broad relationship between place and memory, specifically, how place cells may act as an indexing system for memory storage and retrieval. This line of thinking is prescient and continues through the present. The chapter ends with a consideration of the relationship between place cells and language, a direction of thinking that has not been as productive. In brief, the 1970s saw initial reports of the discovery of place cells and the publication of “The Hippocampus as a Cognitive Map”. These landmark events set cognitive neuroscience on a course aimed at deciphering the neuronal basis of cognition. The 2014 Nobel prize is a recognition of the progress that has been made in that direction. The technical explosion has gone from recording single cells, to dozens, hundreds or thousands. The computer techniques for collecting and analyzing data have made radical gains. Discoveries of other spatial cell types, notably head-direction cells, grid cells and border cells, combined with increased knowledge of the circuitry within the hippocampus have led to clearer understanding of how the neuronal circuits in the hippocampal region process spatial information4. The findings triggered the development behavioral techniques for studying cognition in animals, most notably Richard Morris’ development of the water maze. Intervention experiments have expanded from lesions to electrical stimulation to opto-genetic stimulation. Experimental subjects broadened from rats to mice, to bats to humans. Neuronal models have gone from rough paper-and-pencil guesswork to computer simulations of millions of neurons. More significantly, the discovery of place cells and publication of The Book, led to studies and understanding in broad areas of cognition. While much has been learned about the “brain’s GPS system”, place cell studies have been a trigger, providing insights into other areas of cognition. Some examples: Gyorgi Buzsaki, David Redish, Loren Frank, George Dragoi and others have used place cell studies to explore the neuronal substrate of episodic memory. Numerous labs have used place cells as tools for exploring neuronal plasticity, learning and memory, notably Edvard Moser, May-Britt Moser, and John O’Keefe. Howard Eichenbaum and others have used place cell models to explore how animal’s learn temporal relations. Michael Hasselmo, Gyrogi Buzsaki, Neil Burgess and others have used place cells as a tool for understanding the relations between neuronal cell firing and brain oscillations. Eleanor Maguire and others, with human subjects, have explored the relation of hippocampal spatial processing to the ability to imagine future scenarios. Hippocampal place cells have been used to study the neural basis of cognitive changes in disease, including Alzheimer’s, epilepsy, and schizophrenia. In brief, the discovery of hippocampal place cells, followed by the intellectual tour-de-force of “The Hippocampus as a Cognitive Map” triggered a new age in cognitive neuroscience, an age in which it seems possible to understand the cellular dynamics of cognition. * Note: this blog has been reposted, with slight modification, on the blog.brainfacts.org blog site. 1 “Hippocampus as a Cognitive Map” is out of print. Used copies appear to cost about $700. Fortunately, a fine digital version is free, legal and available here or here (not working at the moment). 2 In Douglas Adams’ novel “The Hitchhiker’s Guide to the Galaxy”, Arthur Dent, after long search, finds the answer to the ultimate question is “42”. A much tougher problem is identifying the question. 4 Head-direction cells were discovered by Jim Ranck and have been intensively studied by Jeff Taube and others. Grid cells were discovered in the Moser lab in Trondheim and been intensively studied there and in London. Border cells (boundary-vector cells) were described by Lever et al (2009, prediction model in 2006). Granule cells appear to be place cells with many firing fields. Interneurons in CA1 and CA3 were characterized by Jim Ranck and Steve Fox and classified “theta cells”. This entry was posted in Hippocampus, Memory by jkubie. Bookmark the permalink. Hi John, I’m glad you took the time to write this. That book is a classic and still well worth reading — at least the introductory chapters. Particularly after the Nobels it is well worth revisiting.